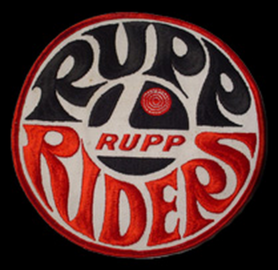 Rupp Industries was a Mansfield, Ohio based manufacturer of go-karts, mini-bikes, snowmobiles, and other off-road vehicles founded by Mickey Rupp in 1959. Rupp Industries operated from 1959 until bankruptcy in 1978. Rupp vehicles are known for their performance and bright red coloring, particularly the snowmobiles and off-road vehicles. They have since become extremely collectible.